According to Vision Hill Research, during the fourth quarter of 2018 actively managed crypto hedge funds outperformed bitcoin and passive indices across the board by +27.0% on average. In particular, actively managed crypto hedge funds outperformed bitcoin by +24.7%, the Bitwise 10 Large Cap and Bitwise 20 Mid Cap by +27.1% and +31.0%, respectively, the Bletchley 10 and Bletchley 20 Indices by +22.9% and +29.4%, respectively, and the Bloomberg Galaxy Crypto Index by +26.7%. 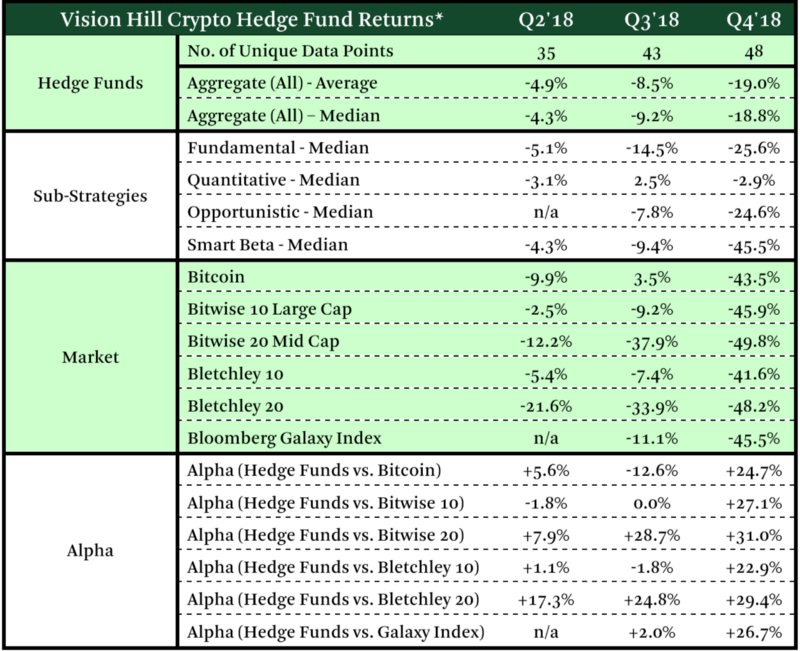 Vision Hill Research found the median quarterly return of its in-scope crypto hedge funds (48 unique data points used for this analysis) to be -18.8% during the fourth quarter of 2018, whereas bitcoin’s quarterly return amounted to -43.5% over the same time period (driven by a weak November). The Bitwise 10 Large Cap, Bitwise 20 Mid Cap, Bletchley 10, Bletchley 20 and Bloomberg Galaxy Crypto Index put up fourth quarter 2018 returns of -45.9%, -49.8%, -41.6%, -48.2%, and -45.5%, respectively. It should be noted that several crypto hedge funds voluntarily elected not to report their performance to us this quarter, and others did not yet have their finalized performance for fourth quarter 2018 available in time for this analysis. As we discussed in our original Q2’18 publication, we take benchmarking biases such as self-reporting bias, survivorship bias and backfill bias very seriously as it pertains to this quarterly study, and will manage such biases appropriately going forward. Lastly, we witnessed two funds that previously contributed to this collaborative study shut down their operations in the fourth quarter of 2018; as such the performance of these funds was not included in this quarter’s findings. As with prior quarters, we will continue to provide these reference points on a quarterly basis going forward segmented by fund strategy as well as fund type. It should be noted that these performance metrics are quarterly metrics as of a particular point in time (October 1, 2018 through December 31, 2018), that represents only a limited snapshot and should not be considered as long-term indications of performance. This analysis should only be used as of this point in time as a framework. The digital asset class remains highly volatile and in the early stages of development, and past performance is no guarantee of future results. As will be discussed herein, we do not believe we have a perfect solution for benchmarking and are not trying to present this piece as such. Rather, we are seeking to continue improving our existing framework. We also continue to relay a call to action to the community to help us work on improving this framework so that it may one day become more widely adopted for benchmarking purposes by fund managers and institutional investors. For a quick recap of what attributes we believe a good benchmark should possess, as well as what challenges we are aware may arise over time in regard to benchmarking in this nascent asset class, we encourage you to review the Q2’18 publication. Let’s dig in. With respect to the public crypto markets, as noted earlier, we are referring to the public side of the market; we are referring to bitcoin, ether and other publicly-traded, liquid, listed digital assets. As of the date of this publication, the total current network value of publicly listed digital assets is ~$130B, according to CoinMarketCap. On the private crypto market side, we have continued to see capital formation around private token projects that have not undergone public sales: such examples include Filecoin, Blockstack, DFINITY, Telegram, Hashgraph, and so on. Rather, similar to what is seen in the traditional venture capital markets, we have seen investors participate in simple agreements for future equity and/or tokens (“SAFEs” and “SAFTs”, respectively), or in certain cases, Series A fundraising rounds, Series B, Series C and so on. At the time of this writing, based strictly on the latest recorded post-money valuations, we believe this private token market to have an aggregated paper network value in the approximate $15-$20 billion range. However, it should be noted that this estimated private token market valuation range may not (and likely does not) correspond to fair value. Given the public market drawdown in 2018, and considering that public valuations generally act as points of reference for private ones, the fair value of the private token market could be (and likely is) substantially lower than the aforementioned estimate that was based strictly on latest recorded paper-based post-money valuations. Next, we believe there are crypto-enabled markets that either bootstrap existing business models and tailor them toward digital assets, or create new businesses in the digital asset industry. Examples of such businesses include enabled infrastructure such as exchanges, custody services, broker-dealers, over-the-counter trading desks, issuance platforms, lending platforms, service providers and research-oriented news platforms. At the time of this writing, based strictly on the latest recorded post-money valuations, we believe this private (venture) equity market to have an aggregated paper network value of approximately $35 billion. However, as noted above, this estimated private (venture) equity market valuation may not (and likely does not) correspond to fair value. Given the public market drawdown in 2018, and considering that public valuations generally act as points of reference for private ones, the fair value of the private (venture) equity market could be (and likely is) substantially lower than the aforementioned estimate that was based strictly on latest recorded paper-based post-money valuations. Lastly, with respect to the crypto hedge fund landscape (excluding crypto venture funds), we estimate the aggregate assets under management (”AUM”) as of fourth quarter 2018 to be approximately $4.5 billion, with the top 20 funds having approximately 53% of the aggregated landscape AUM under management. It should be noted these AUMs do not include traditional asset managers that have made crypto-related investments as an extension of their legacy fund strategies; rather, these AUMs strictly pertain to crypto-native hedge funds. 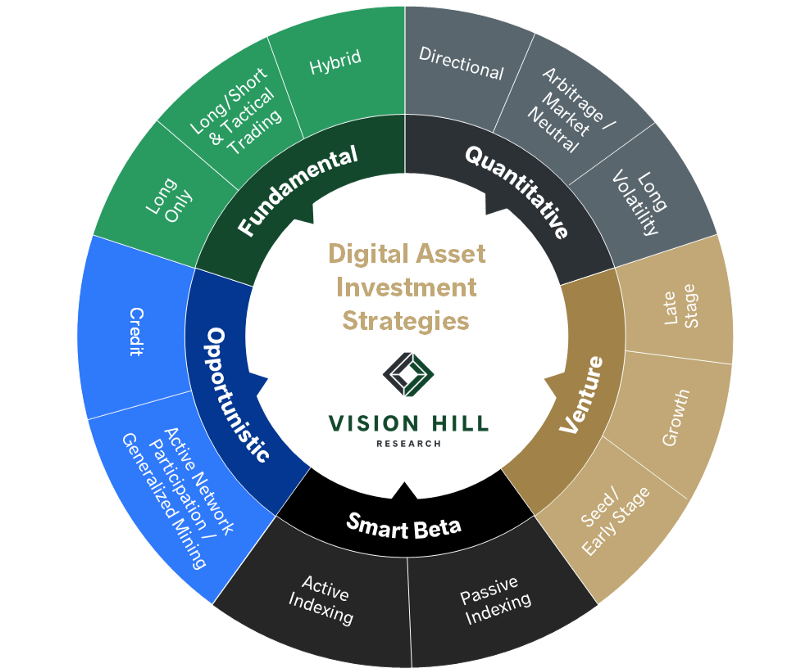 For context, as of second quarter 2018, Vision Hill Research estimated the aggregate AUM for the crypto hedge fund landscape to be approximately $6.0 billion, with the top 20 funds having approximately 40% of the aggregated landscape AUM under management. Long Only — these are managers that employ extensive, deep value research and experiment with quantitative and qualitative metrics to determine what digital assets have the potential to accrue large amounts of value over time. These managers find assets they have high conviction in, and buy and hold those assets for a certain period of time. This is popular in both liquid and illiquid strategies (e.g., both public and private markets). We have begun to see some development around a stack element focus (e.g., base-layer focus, layer 2 solution focus, middleware focus and/or application layer & UI/UX focus), but generally speaking still find most of these managers to invest across the entire ecosystem stacks at present. Long/Short & Tactical Trading– these managers similarly undergo extensive research in the space, but instead of only buying and holding assets they believe will accrue value, they also short-sell and tactically trade assets that they believe are expected to increase and decrease in value as a result of internal signals, sophisticated factor-based models and expected catalyst events. This is more popular in the public (liquid) crypto markets. Hybrids — in certain cases, managers possess a hybrid strategy where they are investing in high conviction projects in both liquid and illiquid (public and private) crypto markets. Some managers choose to only be long in both markets, while others choose to actively short-sell and tactically trade where they are able to. Directional — these are managers that run highly sophisticated quantitative models that produce either “risk-on” or “risk-off” trading signals that direct these managers to execute their discretionary investment strategies in an aggressive or passive way depending on the perceived market cycle. Momentum, sentiment, trend and some systematic algorithmic trading strategies also tend to be popular here. This strategy can be focused on a single digital asset, a basket of digital assets, or relative value trading between assets, but is largely reliant on a quantitative model. Arbitrage / Market Neutral — these are managers that utilize strategies that remove or limit market risk while capturing alpha returns. Exchange arbitrage strategies capitalize on the price discrepancies between different exchanges geographically or on pair trades within the same exchange, while managed futures, developing derivative strategies, or HFT seek returns with minimized market risk. Systematic algorithmic trading strategies also tend to be popular here. Long Volatility — We are seeing this as a developing quantitative strategy whereby managers focus on the Greeks, including Delta, Theta, Rho, Gamma and Vega to manage risk from the perspective of volatility. These managers typically enter into option positions that are long volatility whereby if volatility increases, the manager would be expected to outperform. Credit — these are managers that are leveraging the traditional lending business model and applying it to this new asset class. Such managers purchase loans backed by digital asset collateral and earn interest/yields on these cash loans. This has been growing in popularity lately as many holders of digital assets want liquidity but do not want to monetize their positions to trigger taxable events or give up the potential upside they believe these digital assets can achieve in the future. Typically, in the private markets, we see a bifurcation between private token strategies and private equity strategies. On the private token side, we see managers investing in projects undergoing private presales, follow-on sales, and the like, whereas on the private equity side, managers are focusing on business models that do not warrant a token and instead invest in these businesses as you would in traditional venture equity. We typically see three sub-strategies here, but for the purposes of our framework, we refer to this strategy as simply venture. 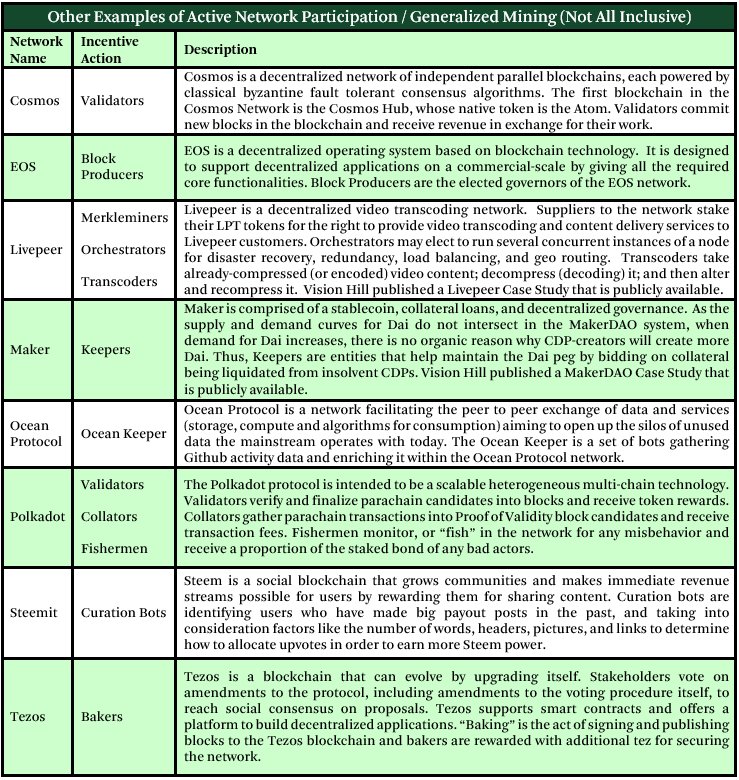 Seed/Early Stage — these are investors that finance the very early development of new products or services. Typically, we see simple agreements for future tokens (“SAFTs”), simple agreements for future equity (“SAFEs”), pre-sales, and early stage private sales (typically Series A) as the investment structures in this strategy. Growth — these are investors that finance expansion and help projects position for critical mass. Typically, we see private sales (typically Series B, Series C, etc.) as the investment structures in this strategy. On the token side, we see larger private accredited investor rounds to increase distribution and participation. Late Stage — these are investors that finance positions that are in the works of positioning themselves for public offerings. The projects can demonstrate significant growth but may or may not be showing value accretion. Projects have usually been in existence for more than three years. Typically, we see later-stage private sales (Series D, and onward) as the investment structures in this strategy. On the token side, this might take the form of a public token sale, launch of the network, airdrop, or public listing of tokens on an exchange. Active Indexing — these are managers that index to a certain benchmark but are overweighting or underweighting certain selected digital assets actively in an effort to outperform the benchmark. Passive Indexing — these are managers that create a market-weighted index or portfolio in an effort to offer a diversified, low turnover, low cost alternative (e.g., basket funds and the like) to actively managed fund strategies. Usually there is a “smart” element to its genesis structural composition before it becomes fully passive. Presented below (where sufficient data was available), are what we believe are comparison points of like-kind managers for the three-month periods ended December 31, 2018, September 30, 2018 and June 30, 2018. For confidentiality purposes, we are unable to disclose any specific performance numbers or specific manager names; we only present measures of central tendency and generalized brackets of performance to protect manager privacy. We also elected to solely present data for the full three months leading up to each period. At this time, we are not including periods such as year-to-date given many funds launched at different points in time over the course of 2018. Returns below are net of all management & performance fees to the best of our knowledge. *It should be noted that these performance metrics are quarterly metrics as of a particular point in time, which represents only a limited snapshot and should not be considered as long-term indications of performance. This analysis should continue to be used as of this point in time as a framework. The digital asset industry remains highly volatile and in the early stages of development, and past performance is no guarantee of future results. For the purpose of this exercise, we had 48 unique data points to consider for the three-month period ended December 31, 2018. Out of our internal database of over 425 crypto funds and counting, we have diligenced approximately 100 funds so far as of the date of this report and found some funds were either pre-launch or launched during the fourth quarter of 2018 (and thus didn’t have a full quarter worth of data). For data to be presented in the aforementioned quartiles, we decided a minimum of five data points must be available for any particular strategy. It should be noted that several crypto hedge funds voluntarily elected not to report their performance to us this quarter, and others did not yet have their finalized performance for fourth quarter 2018 available in time for this analysis. As we discussed in our original Q2’18 publication, we take benchmarking biases such as self-reporting bias, survivorship bias and backfill bias very seriously as it pertains to this quarterly study, and will manage such biases appropriately going forward. Lastly, we witnessed two funds that previously contributed to this collaborative study shut down their operations in the fourth quarter of 2018; as such the performance of these funds was not included in this quarter’s findings. As noted previously, we seek to provide points of reference for measuring performance among similar investment strategies, and we plan to deliver these performance statistics on a quarterly basis going forward. We are targeting mid-May 2019 for our release of the March 31, 2019 first quarter fund performance. We hope each quarterly publication continues to include more unique data points with the helpful collaborative efforts of all crypto fund managers. It should be noted that we do realize these benchmark comparison points are imperfect for a variety of reasons, hence we originally proposed this as a framework at best. First, the number of unique data points we have used in this exercise (48) continues to be relatively limited. While typically statistically significant sample sizes warrant a minimum of 30 variables, it is nonetheless our goal to continue to work with the community to collect more data over time so that future quarterly releases can grow more robust in size and fund managers can start comparing performance against reliable data points of like-kind managers and strategies. Thus, if you are a crypto fund that has not connected with us yet, are reading this, and want to contribute to helping us, please add us to your monthly and/or quarterly performance distribution list. We have set up tracking@visionhilladvisors.com for this very purpose and will look to automate this over time. Moving forward, we will look to develop a transparent opt-in system of reporting and ranking guided by community consensus and traditional market best practices. In sum, we understand benchmarking is a challenging topic in the digital asset class given how early it still is. We do not believe we have a perfect solution for benchmarking and are not trying to present this piece as such. Rather, we continue to build on our existing framework and hope to continue to work with the community to improve this framework so that it may one day become more widely adopted by fund managers and institutional investors. Additionally, if you have any feedback or comments surrounding how we can improve this developing benchmark, we’d love to hear from you. You can email us at info@visionhilladvisors.com with “Benchmark” in the subject line.